Posted By:Unknown | At:12:41 PM Be the first to comment! (Orlando Sentinel) -- An Academy Award-winning actor and a famed stand up comedian will attend a weekend event in Miami in remembrance of Trayvon Martin, a law firm representing the slain teen's family has announced. The Tallahassee-based Parks & Crump firm announced that Jamie Foxx and Cedric the Entertainer will attend the "Day of Remembrance Community Peace Walk and Forum," which is being hosted by foundation created by the teen's parents. The event, which starts 10 a.m. Saturday at Ives Estate Park in Miami, will focus on "motivating youth on peaceful conflict resolutions instead of gun violence," the firm said in a statement. The following evening, the foundation plans to hold a remembrance dinner at the DoubleTree Miami Airport Hotel's convention center. Foxx won an Oscar for his role as Ray Charles in the 2004 biopic "Ray," and is also a singer-songwriter and comedian. Cedric the Entertainer is famed for his stand up comedy, as well as numerous roles in television and movies. 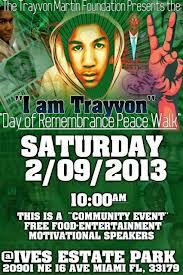 Trayvon was fatally shot by George Zimmerman in a Sanford townhouse community on Feb. 26. Prosecutors say Zimmerman, who is charged with second-degree murder, profiled and killed the teen. Zimmerman says he fired in self defense. The case, which sparked protests and rallies last year, is set for trial in June.